It is with great sadness that we report the death of DOUGLAS MAC MURRAY YOUNG at the Veterans Health Unit on December 18, 2017. Murray, the son of Harold M. and Amelia ("Millie" Foreman) Young, was born at Taymouth, N.B. on July 11, 1922. Murray was educated in Marysville and Fredericton schools and received a teaching diploma from the Provincial Normal School. After teaching in rural schools for two years, he joined the RCAF, training as a radar technician. He was sent to Britain where, from 1942-45, he repaired radar equipment and monitored enemy aircraft and shipping. 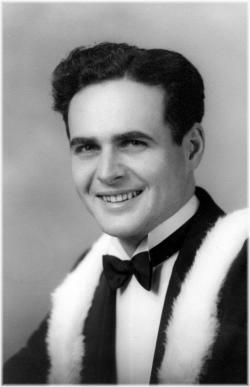 Returning to Canada at the end of the war, he entered the University of New Brunswick and graduated with an Honours degree in English and History. Like so many returning veterans, he took a lively interest in politics and, while still a student, he stood as a candidate for the CCF Party in both a provincial and a federal election. He then entered the University of Toronto to work towards a Master’s degree but an offer of a Beaverbrook Overseas Scholarship led to study at King’s College, London University, where he obtained a Ph.D. in Imperial History. His resulting book, The Colonial Office in the Early Nineteenth Century, is still a leading source on the subject. After teaching for four years at Memorial University in Newfoundland, Murray received a Ford Foundation Fellowship to take a postdoctoral course on African History at Boston University. He then returned to his alma mater and taught at UNB for the rest of his career. He regarded teaching as the most important facet of his work. He always tried to give his students a wide understanding and was particularly good at placing events in a broad context. He served a term as departmental chair, supervised many theses, and was active on many university committees, including as a faculty representative on the Board of Governors. His well-received public lectures helped to expand the interest in local history, while his own broad interests ranged from imperial and colonial administrative history to the history of decolonization of Africa, and the evolution of New Brunswick as a province of Great Britain, then of Canada. He wrote numerous book reviews and articles, including biographies for the Dictionary of Canadian Biography. His extensive contributions to local history were recognized by the Fredericton Region Museum with the Martha J. Harvey Award (1993) and also by the Marysville Heritage Committee with the first D. Murray Young Heritage Award (2006), named in his honour. Murray was always kind to others and his quick wit and sense of humour often led to family fun. He loved long walks in the countryside and we celebrated many happy occasions at family gatherings. Much beloved by his family, Murray appreciated the care given to him by his sisters in his early life, after the death of his mother. He is survived by Mary, his wife of 63 years; by his three children, Christopher (Pamela) Young, Graham (Vicki) Young, and Carolyn Young (John Thistle); by five granddaughters, Gillian and Rachael Young, Erica and Juliana Young, and Fiona Thistle; two sisters-in-law, Delia Hachey and Muriel Young; as well as many nephews, nieces and several cousins. He was pre-deceased by his parents; step-mother, Jennie V. Young; his sisters, Rhoda Sandberg, Grace Bawn, Phyllis Burpee, Marguarita ("Rhete") Dorcas and Jean Burden; as well as two brothers, Mullan and Guy Young. His family thank the staff of the Veterans Health Unit for their great kindness to Murray while under their care. A celebration of Murray’s life will be held at J.A. McAdam Memorial Chapel on Saturday, January 13, 2018 at 2 pm with Archdeacon John Sharpe officiating. For those who wish and in lieu of flowers, donations in Murray’s memory can be made to the "Dr. D. Murray Young Fund" for hiring historical researchers at the University of New Brunswick, or to a charity of the donor’s choice.